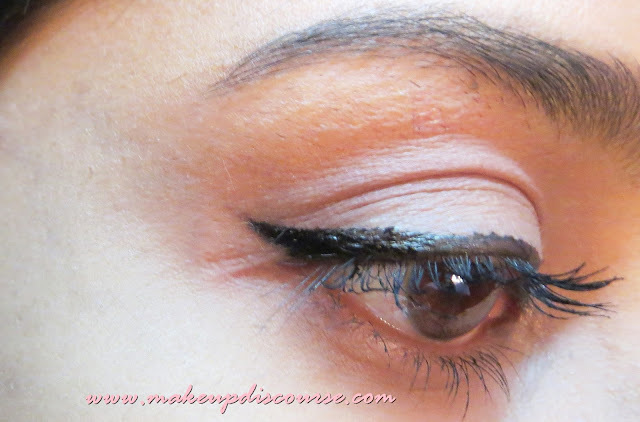 Bourjois Mega Liner in 02 Ultra Black Review: Swatches, EOTD, FOTD & Availability in India. I disdain the very fact that even though how much I love this one, I won’t be repurchasing this. I am truly savouring this for exclusive days only because it is like no other. It is ultra black and has a glossy finish. The jet black brings out the brown in my eyes. For the days, I want to emphasise my eye colour with certain coloured attires. For instance: Black or Cream white. The Pen is slightly heavier, maybe because of the packaging. The felt tip has an angled edge which makes drawing a flick or wing easier. 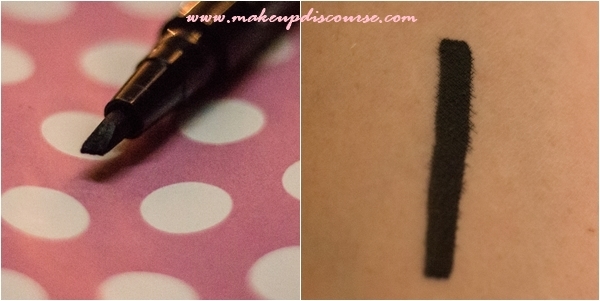 The Impression of Bourjois Mega Liner in Ultra Black. The Formula has a slight semblance to a Liquid liner, the formula is watery but intense black. The angled edge creates easy flicks and wings. You can certainly flip the angled edge to get a thick, intense line. The Finish is glossy enough for the intensity of the black to peek through. It does go opaque in a single stroke. Bourjois Mega Liner in Ultra Black is not waterproof but water resistant. It does withstand the humid weather of Mumbai but fails to be smudge-free after coming in contact with water/sweat. [Definitely No-No for monsoon, hence I have this one tucked away.] But if compare with other drugstore brands, Bourjois Mega Liner outlasts them in terms of longevity. The Unavailability of the shade in India and a fancy Price Tag are absolute drawbacks of Bourjois Mega Liner. Why I love Bourjois Mega Liner in Ultra Black? ♥~ Intense Black Eyeliner, also the pigmentation is exceptional. 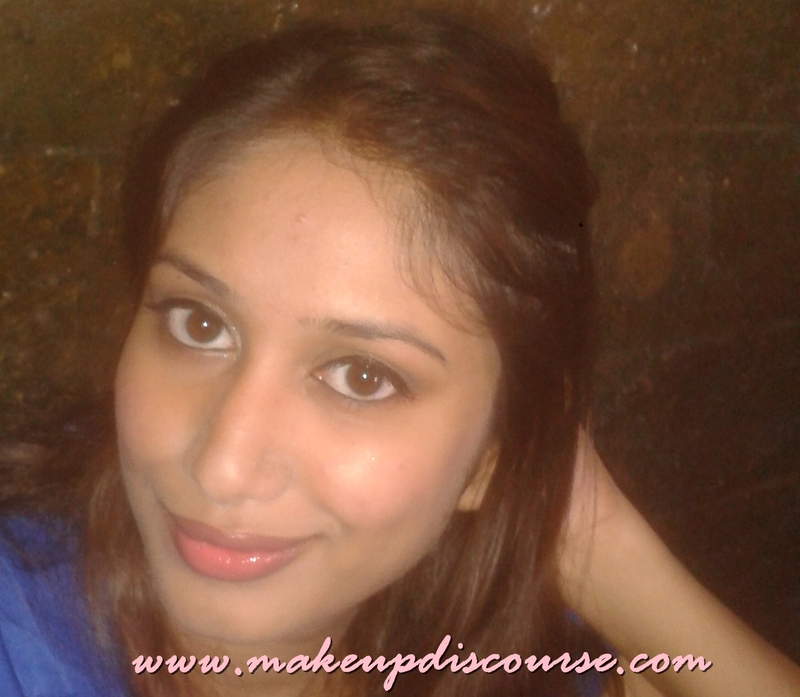 ♥~ Staying power varies from 7-8 hours with primer underneath. ♥~ A glossy finish, when layered brightens the eyes. ♥~ The angled nib eases the application. Why I loathe Bourjois Mega Liner in Ultra Black? ❥~ Feathers, just like every other eyeliner out there. The pigment does seep into the fine creases/lines on my eyelids. My skin overall is thin and is 5x thinner around the eye. The feathering of eyeliner on application decreases as the formula dries over the time. Recommendation: I would definitely recommend this over the other drugstore brand eyeliners. Bourjois Mega Liner in Ultra Black is intense black with a glossy finish. It does stay up to 7-8 hours withstanding the humid weather. And to add, the slanted edge is precisely for a sharp flick, for the drama. Asos's custom duty taxes are prepaid and arrives within 7-10 days. Feelunique takes 3-4 weeks.